diary of a former scrapbook store owner: "Might as well put God on the train"
We have a Fisher Price "Little People" Nativity set. As I mentioned, we opted not to put our old very breakable glass ornaments on the tree this year. Ditto the hand-painted ceramic Nativity my mother made for me years ago. So out comes the Little people Mary, Joseph and baby Jesus. I had Joshua put it under the tree in the right order. After all, Rob had sat down with the kids only a day or two ago to remind them of the Christmas story. In all the excitement leading up to Christmas, it's hard not to see the joy in the kid's faces, even as I continually pull them down off the ceiling and settle them down once again. But it's also hard not to flinch as they say - "I can't wait til Christmas - so I can open my gifts!" Huh? That's not what we're teaching them. Gifts are fun, but we want to teach them that they are just a reminder of God's greatest gift - his precious Son. And the greatest gift I can give my children is to teach them that. So out comes plastic baby Jesus as we tell the story again. What do you want your Children to remember about Christmas? What legacy will you hand down to them? So here's the challenge part. It's the night before Christmas eve...you're swamped right? thinking about the food you have to prepare, gifts still to be wrapped, and hoping the kids will behave for just one more minute while you finish this. One more note, so I think we are doing well with the Christmas story. I tell Josh to set up the Nativity under the tree while I clean up breakfast table. So of course Noah crawls over to see the new toys. Before I know it, I see Josh and Noah taking the Mary, the wise men and a sheep for a ride on the Christmas train. 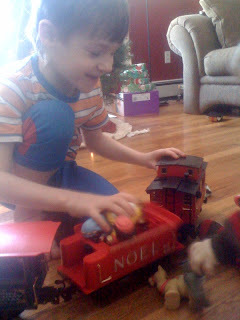 Before I can say anything, Noah plucks one of wise men out of the train. Josh takes a minute, looks at Noah and says "Might was well put God on the train" and on goes baby Jesus. OK, maybe I have some work to do yet. I love this - thanks for the reminder! hahaha at "God on the train." Don't worry if they are focused on the gifts right now. You have to know how good it feels to receive so you can better understand the joy you share when you give. And they'll get the idea pretty quickly because they have awesome parents. Your kids are so cute! I love eavesdropping on children as they play. Love this post, people are forgetting what the Holidays are all about! Love that God got to take a ride on the train!! !